Land Over Sea Coasts in Fair Grounds Oaks: Reddam Racing’s Doug O’Neill-trained Land Over Sea shipped in from California, dodged divisional champ Songbird and annexed a big win in The Big Easy with a 4½-length sigh of class relief Saturday afternoon in the Grade II $400,000 Twinspires.com Fair Grounds Oaks at Fair Grounds Race Course & Slots. The daughter of Bellamy Road sat in sixth before slowly moving her way toward the front and passing Winchell Thoroughbreds’ Steve Asmussen-trained Adore in mid-stretch with methodical momentum. She then extended her lead in the final eighth of a mile to win comfortably. The determined winner scored the second victory of her career and first in a stakes after chasing Fox Hill Farm’s aforementioned champion in her previous five races, including two Grade I efforts. 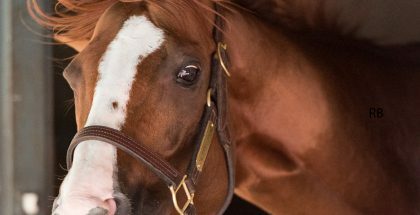 Ridden by John Velazquez for the first time, the chestnut Kentucky-bred and $130,000 OBS April purchase also won for the first time on dirt, having initially graduated on the Del Mar turf in July, while returning $5.60, $3.40 and $2.60 to the loyal fans who made her the 9-5 choice. Stoneway Farm’s Neil Howard-trained Dream Dance ($14 and $7) outran her 23-1 odds under Brian Hernandez, Jr., rallying up the rail in the final quarter to pass Adore ($4) by a neck at the wire. The second-place effort was the daughter of Afleet Alex’s first since November and her third stakes placing. 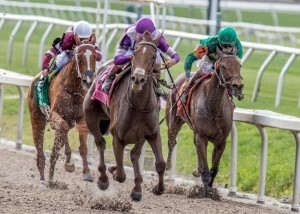 The $244,000 winner’s purse increased Land Over Sea’s career bankroll to $472,000 and assures her a spot in the gate for the Grade I $1,000,000 Kentucky Oaks on May 6. “Good trip and got to the lead pretty easily, but she got a little tired,” said Julien Leparoux, who was aboard Adore. The compact daughter of Big Brown was making her first start in a stakes after a first-level allowance victory at Oaklawn Park five weeks prior. Northwest Tale, Venus Valentine, Stageplay, Midnight On Oconee and Street Fancy completed the order of finish.